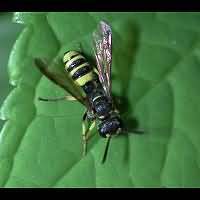 The Digger Wasps in the genus Cerceris are very similar to paper wasps. 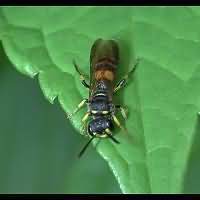 When you see and approach them, without them noticing your activities, they sit still looking like a Sawfly. However as soon as they are aware of your presence, they will open up their wings a bit. 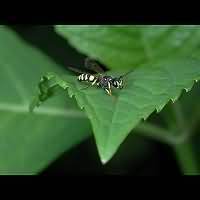 A that moment they do look like a small and slender yellowjacket, as this position clearly reveals the warning colours. However the German expert Heiko Bellmann writes that by spreading its wings the animal can take off more easily. Most Cerceris species hunt for weevils to feed to their larvae. Thus they are often refered to as Weevil Hunting Wasps. Some species hunt for other prey though, usually bees. Of most species the females may be identified in the field, even though a few may present you with some difficulties. Males of most species are too similar to be identified in the field. In all pictures but the bottom one females are depicted. 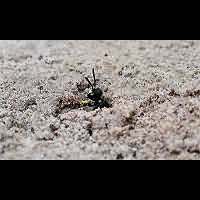 The 4-banded Tailed Digger Wasp is a black with yellow wasp. Especially the first yellow line on the abdomen often is quite broad. Females have a very pointed and slender bottom and are entirely yellow on the underside. 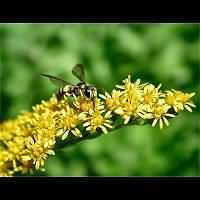 The males are very similar to those of other Cerceris species, especially of Cerceris arenaria. Usually they can not be identified in the field. Males reach a length of 6 to 10mm, females are 7 to 11mm long. 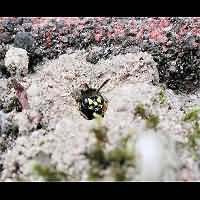 The nests are being made in firm sandy soil. They are hard to find, for they are often hidden amongst vegetation. Each egg is provided with 5 to 15 weevils, usually the bigger Polydrosus species or the very small Apion species. Adults often visit flowers, including those in gardens. Extremely rare in Britain and only found in two counties in England. Quite common on the continent, but not in Scandinavia. Also present in much of Western Asia and Northern Africa. 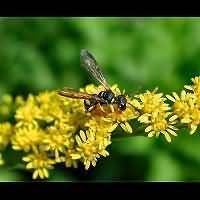 The 4-banded Tailed Digger Wasp is on the wing from May to the end of October.